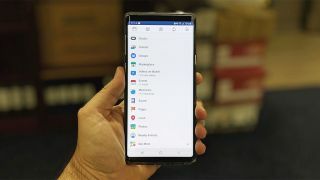 'Dark modes' are all the rage in 2019, with seemingly every app and operating system under the sun implementing the battery-saving feature at the moment. Despite its popular Messenger app receiving a dark mode update, it appears that Facebook itself is bucking the trend, with the world's largest social network currently testing an all-white version of its Android app. First brought to attention by XDA Developers, the refreshed interface drops the iconic (if somewhat dated) blue accents that have been synonymous with Facebook since the beginning, replacing them with a much simpler, completely white color scheme. Based on the images above, it's clear that the social media giant is attempting to apply a singular look to its various apps, bringing Facebook in line with its Messenger app, which has sported an all-white design for quite some time. Alternatively, it could also prove to be Facebook's first step towards implementing a proper dark mode, as the company's signature blue would likely clash against an all-black background. At present, the whitened Facebook app is only available through a server-side switch with no word on when it will be available to the general public. There's also no word on whether the iOS app will receive a similar facelift.